SharpChef is excited to announce that in response to continued feedback, its SharpChef Diamond Knife Sharpener is now also available in black. Customers now have an additional aesthetic option for its top rated three-stage sharpening system. Everyone who uses the SharpChef loves it! But many have been asking for a more generic color to match their kitchen. We listened! Additionally, the product includes a 7.5 inch kitchen knife at no extra cost. This is a promotional tradition that SharpChef started last year with the release of their popular red knife sharpener. Due to its ease of use combined with its razor-sharp results, this product is currently garnering 4.5 stars out of five from its Amazon customer reviews. Suited for home and professional use, the SharpChef uses tungsten carbide, ceramic, and diamond rods to sharpen most kitchen as well as outdoor blades. It's appeal is in its ability to restore lifeless blades ,that would otherwise be ready for the garbage, into a near-new condition. Each rod is preset at a fixed angle, allowing maximal results even for users with no sharpening experience. To perfectly hone a blade, it takes around five to eight strokes. In addition to sharpening steel blades, there is a dedicated slot for sharpening ceramic blades. This is where the diamond abrasive is used to smoothly bring an edge to any ceramic blade. The unit is impact resistant. Its durability is designed for longevity in even the busiest of kitchens. It has been used by even professional chefs in professional kitchen environments. The product is also compact, featuring total dimensions of 8 x 3.5 x 2 inches and weighing just 9.6 ounces. Now in a sleek-looking black color, to complement the existing red version, the professional knife sharpener looks at home in any environment. The matching kitchen knife and sheath are included only for a limited time. 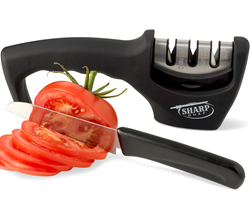 The SharpChef Diamond Knife Sharpener takes the danger out of cutting and dicing food. Dull blades can cause the knife to slip. Together with the ergonomic handle, the rubber feet keep it secure to the counter top while the user is sharpening.